Earn up to 5 FJ Rewards. PURPOSE OF THIS EXERCISE: Provides you with a relaxing stretching exercise that can be done anytime and anywhere there’s room to do it. DESCRIPTION: The entire exercise is done with both hands on the barre or supporting unit. 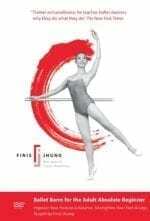 Part One: Instructions from Finis Jhung; Part Two: Demonstration with music by Sachiko Kanai with Finis standing by and coaching. EQUIPMENT: A supporting unit (ballet barre, desk, kitchen counter, book shelf, or sturdy high-backed chair) you can push down on as you go up and down and pull away from as you step back leaning forward with legs straddled.